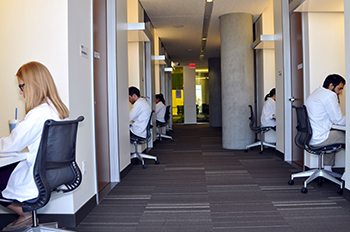 Doctoring activities occur in the Center for Clinical Skills and Assessment on the 3rd floor of the Health Sciences and Education Building (HSEB) in downtown Phoenix. 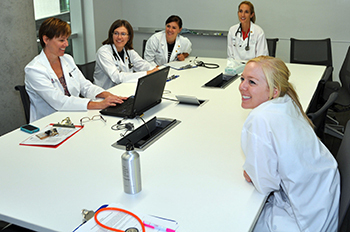 The College of Medicine – Phoenix shares this facility with Northern Arizona University, which hosts Physician Assistant, Physical Therapy and Occupational Therapy programs at this site. There are 24 patient exam rooms, each with a computer in the exam room for the standardized patient (SP) and a hallway computer for a student. There are five debrief rooms with seating for 12 persons, a monitoring room with 24 stations for observers and an adjacent classroom. Each exam room has two cameras with recording capabilities.